Last major update issued on February 11, 2019 at 17:55 UT. The geomagnetic field was quiet to unsettled on February 10 under the decreasing influence of high speed stream associated with CH907 early in the day. Solar wind speed at SOHO ranged between 351 and 463 km/sec. 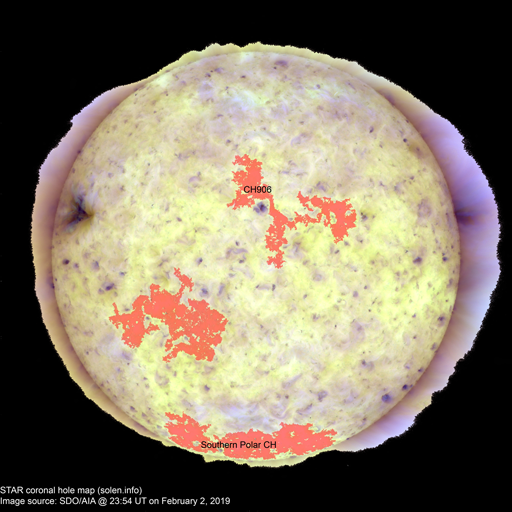 At the time of counting spots (see image time), no spots were observed in using 1K/2K resolution SDO/HMI images. An extension of the southern polar corona hole was Earth facing on February 10-11 and could produce a disturbance on February 13-14. The geomagnetic field is expected to be quiet to unsettled on February 11-14 due to coronal hole effects.